Don’t be put off when you look at an Indian recipe! Although some recipes can look very long the method is usually quite simple. It’s the list of ingredients that will make it appear long and intimidating. And that’s only because it’s likely to include a large number of different spices.If you keep a range of spices in your pantry, you’ll be ready to tackle many Indian recipes but remember that spices don’t keep well. Buy them in the smallest possible quantity and, where you can, buy them in their whole form and grind them down as you need them. Heat the oil in a thick-based frying-pan. Add the cumin seeds and toss them around in the hot oil. Add the remaining spices and salt and mix well. Stir in the potato cubes and make sure they’re well-coated. Add the tomatoes and water. Bring to the boil, cover and simmer gently until the potato is cooked. Stir occasionally. Mix together all the ingredients for the marinade in a large bowl. Stir in the lamb pieces, making sure they’re well-coated. Set aside to marinate for 1 hour at room temperature.Meanwhile soak bamboo skewers in water. Thread the lamb cubes onto the skewers and cook under a moderate grill until done to your taste. Alternatively, cook the lamb on a baking sheet in the oven, 200oC, gas mark 6, for about 20 minutes. Heat the oil and fry the onion until soft. Mix in the spices and, fry for 1 minute, stirring. Add the chickpeas, tomatoes, chutney and stock and stir well. Bring to the boil and simmer for 5 minutes. Serve garnished with chopped coriander. Fry the onion in oil until soft. Add the garlic, chilli and spices, stir well and fry for 2 minutes. Stir in the chicken pieces and make sure they are well-coated. Add the tomatoes and tomato puree, bring to the boil and simmer gently for 4 minutes. Add the coconut milk, bring back to the boil and simmer for a further 3 minutes. Add a squirt of lemon juice. Stir and serve. Use whole chicken breasts but cook for longer. 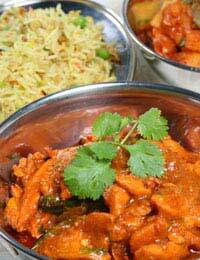 And for a milder flavour, use a milder curry powder, such as korma, and leave out the chilli. To make it hotter, increase the chilli!